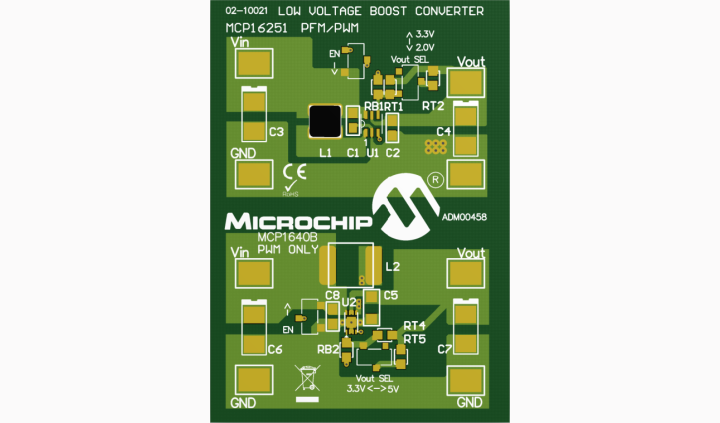 The MIC38300 is a 3A peak, 2.2A continuous output current step down converter. This is the first device in a new generation of High Efficiency Low Dropout (HELDO®) regulators that provide the benefits of an LDO in respect to ease of use, fast transient performance, high PSRR and low noise while offering the efficiency of a switching regulator. As output voltages move lower, the output noise and transient response of a switching regulator become an increasing challenge for designers. By combining a switcher whose output is slaved to the input of a high performance LDO, high efficiency is achieved with a clean low noise output. 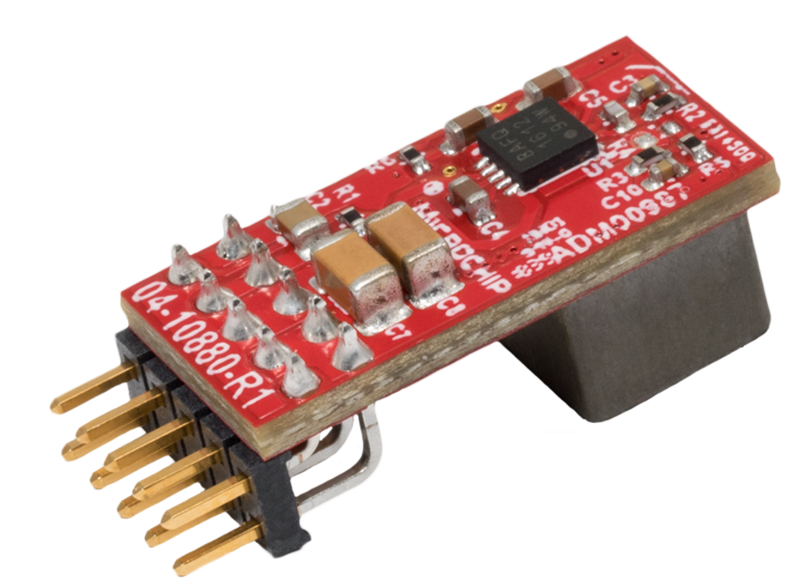 The MIC38300 is designed to provide less than 5mV of peak to peak noise and over 70dB of PSRR at 1kHz. Furthermore, the architecture of the MIC38300 is optimized for fast load transients allowing to maintain less than 30mV of output voltage deviation even during ultra fast load steps, making the MIC38300 an ideal choice for low voltage ASICs and other digital ICs. The MIC38300 features a fully integrated switching regulator and LDO combo, operates with input voltages from 3.0V to 5.5V input and offers adjustable output voltages down to 1.0V. What if there was a way to drive a fan so that it could do the same amount of work using a quarter of the power? 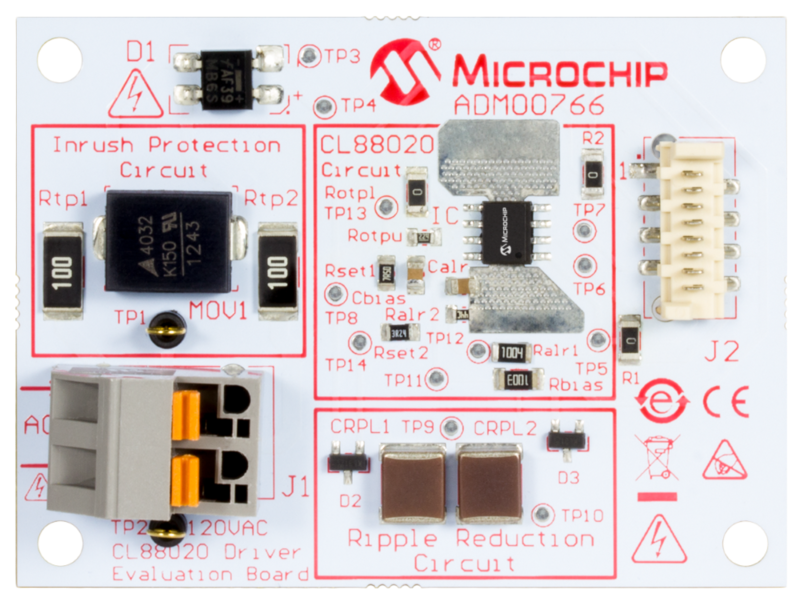 Microchip has developed a reference design that demonstrates how you can drive a ceiling fan at 300 RPM and only draw 25W—about the same amount of power that an LED bulb requires. 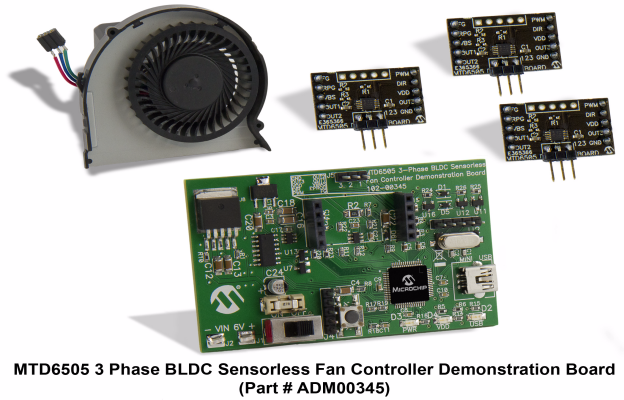 This demo uses a Brushless DC (BLDC) motor and an electronic commutator to enable active devices, such the microcontroller’s power stage, to drive the motor and power management devices to regulate power and connectivity devices. HV2070 Analog Switch Evaluation Board (ADM00853) works with the HV MUX Controller Board (ADM00825) to provide No High-Voltage Bias, L-Switch Architecture, 32-Channel, High-Voltage Analog Switch demonstration including basic switch ON/OFF operation and 2:1 MUX operation with two built-in MD1822 and TC6320 pulser circuits. HV2903 Analog Switch Evaluation Board (ADM00795) works with HV MUX Controller Board (ADM00825) to provide No HV bias, 32-Channel HV Analog Switch demonstration including basic switch ON/OFF operation, and 2:1 MUX operation with two built-in MD1822 and TC6320 pulser circuit. 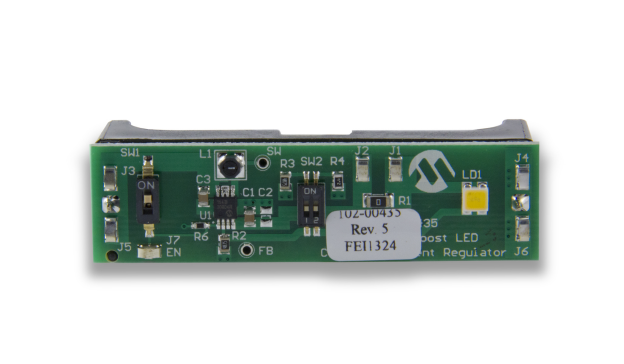 The MCP1252 Charge Pump Backlight LED Demo Board demonstrates the use of a Charge Pump device in an LED application. 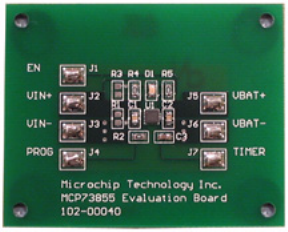 The board also serves as a platform to evaluate the MCP1252 device in general. The MCP1252-ADJ is an excellent choice for biasing the back lighting or driving other LED applications. Light intensity is controlled uniformly through the use of ballast resistors. The peak intensity is set by the feedback to the the MCP1252-ADJ. Dimming is accomplished by pulse-width modulating the shutdown pin of the device. The board also feature a PIC10F206 microcontroller in a SOT23 package, which is used to provide an enable signal to the MCP1252. The PICmicro also accepts a push-button input that allows the user to adjust the white LEDs to five different light intensities, in addition to placing the system in a standby mode that consumes less than 1 uA of current (typical). 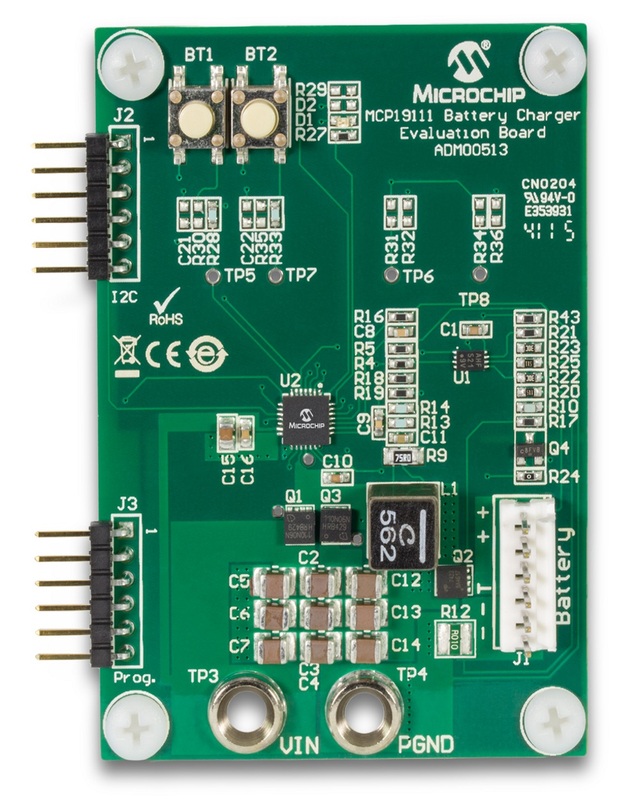 The MCP1601 Buck Regulator Evaluation Board demonstrates Microchip's MCP1601 Synchronous Buck Regulator, developed for battery powered applications as well as distributed power applications. 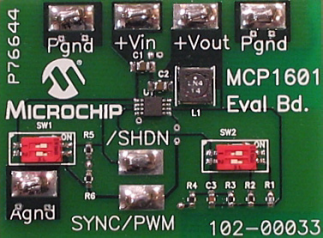 The MCP1601 Evaluation Board is capable of operation over the entire 2.7V to 5.5V input range of the MCP1601 device. Two 2-position DIP switches are used, one to select the output voltage (1.8V, 2.05V, 2.45V or 3.28V) and one that turns the MCP1601 on and off with the other position selecting the mode of operation (PWM-pulse width modulation or PFM-pulse frequency modulation). Surface mount test points are used to apply power and load in addition to probing several points in the test circuit. 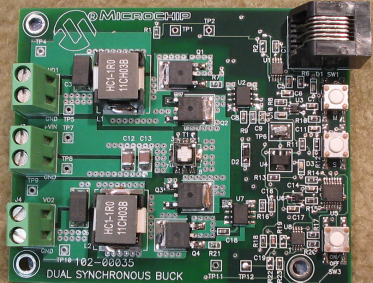 The MCP1612 Synchronous Buck Regulator Evaluation Board features Microchip Technology’s 1A 1.4MHz synchronous buck regulator in two buck converter applications. The first application uses the MCP1612 in the 8-leaded MSOP package. This converter has four (0.8V, 1.0V, 1.2V, and 1.4V) selectable output voltages available. The second application features the MCP1612 in the 8-leaded DFN package. This converter also has four (0.8V, 1.7V, 2.4V, and 3.3V) selectable output voltages. A shutdown terminal is also provided for each converter. 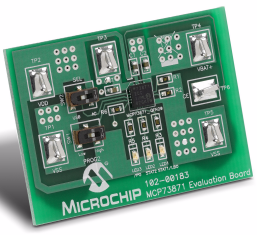 The MCP16251 and MCP1640B Synchronous Boost Converters Evaluation Board is used to evaluate and demonstrate Microchip Technology’s MCP16251 and MCP1640B products. 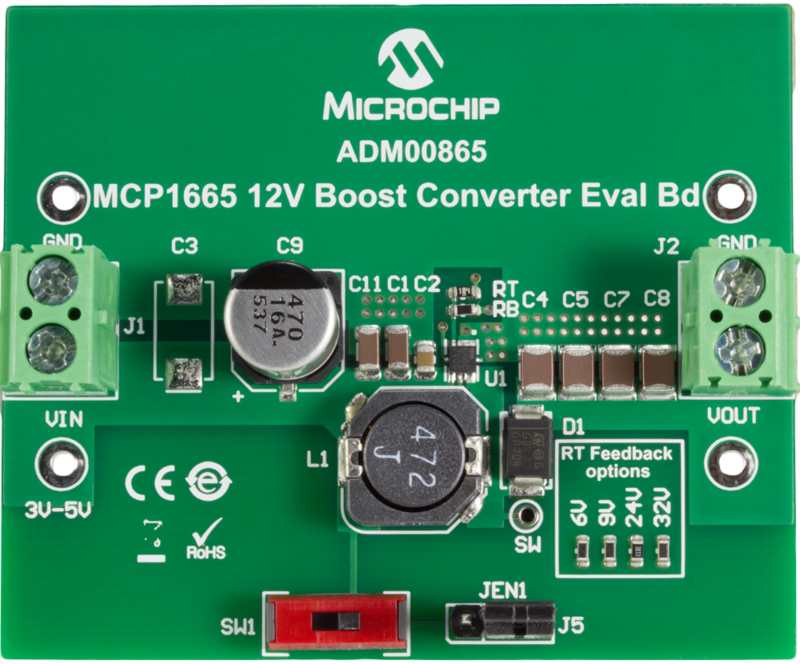 This board demonstrates the MCP16251/MCP1640B in two boost-converter applications with multiple output voltages. It can be used to evaluate both package options (SOT-23-6 and 2x3 mm 8-(T)DFN). 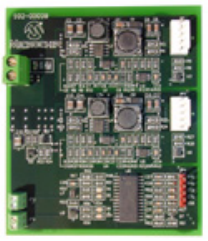 The MCP16251 and MCP1640B Synchronous Boost Converters Evaluation Board was developed to help engineers reduce the product design cycle time. Three common output voltages can be selected: 2.0V, 3.3V and 5.0V. The output voltage can be changed with a mini-dip switch that changes the external resistor divider. A switch connected to the EN pin is used to enable and disable the converters. When enabled, the MCP16251/MCP1640B will regulate the output voltage; when disabled, the MCP16251/MCP1640B disconnects the path from input to output for “true-disconnect”. 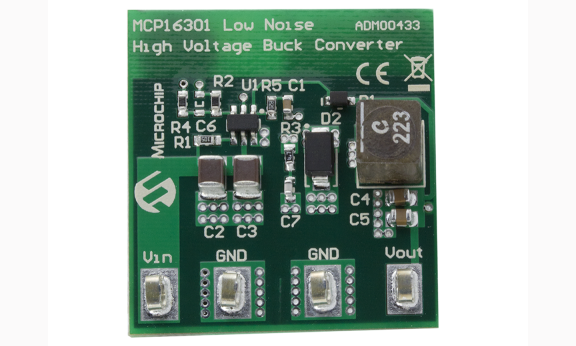 MCP1630 12V in Dual Output Buck Converter Ref. Des. The MCP1630 Dual Synchronous Buck Regulator demo board is a dual output programmable power supply capable of 20A per output. Both outputs switch at 500 kHz 180° out of phase while powered from a +12V-input source. Additional features include programmable output voltage, power good output indication, sequencing, over current and over temperature. 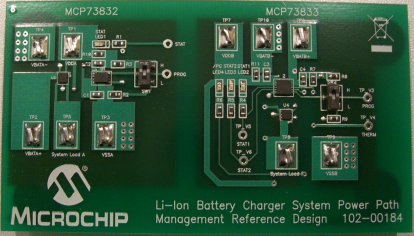 MCP1630 Low Cost Li-Ion Battery Charger Ref. Des. 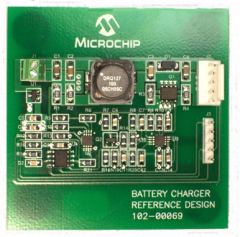 The MCP1630 Low Cost Li-Ion Battery Charger is used to evaluate Microchip’s MCP1630 used in a SEPIC power converter application. The MCP1630 Low Cost Li-Ion Charger is capable of charging a single-cell, Li-Ion battery pack utilizing an input voltage of 6V to 18V (battery packs are not included). The MCP1630 Low Cost Li-Ion Battery Charger provides a constant current - constant voltage charge with preconditioning, cell temperature monitoring, and battery pack fault monitoring. The battery charger provides a status and fault indication. The MCP1630 Low Cost Li-Ion Battery Charger automatically detects the insertion or removal of a battery pack. 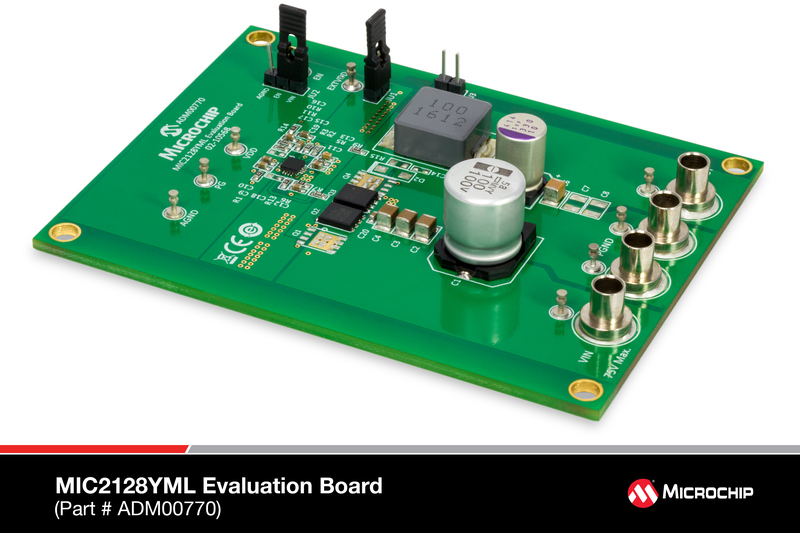 The MCP16301 5V/600mA Low Noise Evaluation Board is used to demonstrate a high voltage input DC-DC converter design, which can deliver high efficiency, while minimizing high-frequency switching noise. 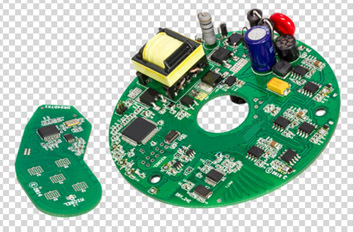 The board steps down high input voltages, up to 30V, to a low output voltage, having more than 90% efficiency and a minimum of 30 mV output ripple. High-frequency input/output noise generated by the switching converters can reach high-noise levels that interfere with other devices powered from the same source. The high amplitude of high-frequency noise can disturb some RF systems. High efficiency is achieved with the MCP16301 buck converter by switching the integrated N-Channel MOSFET at a high speed. 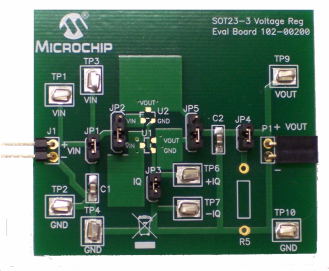 The evaluation board is optimized for 12V Input and 100 mA load. 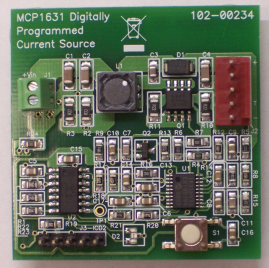 Demo board supporting the development of MCP16301 high input voltage, 300mA, D2PAK buck converter. 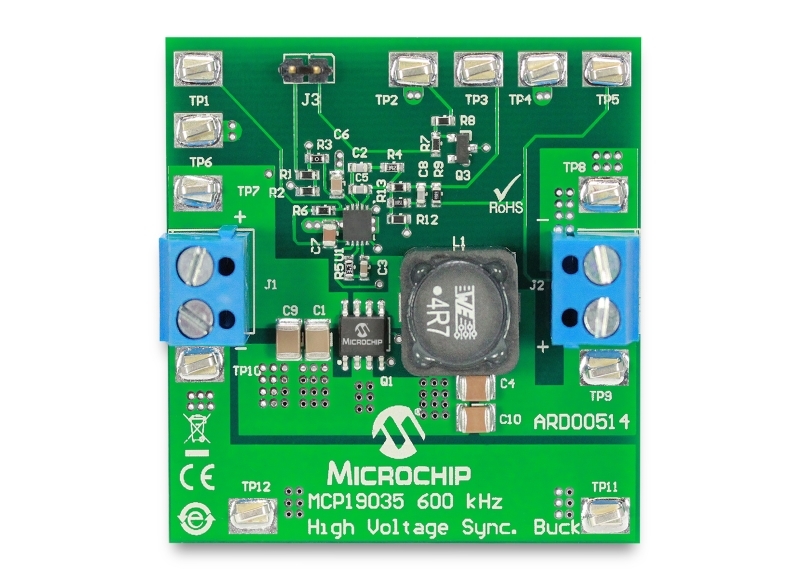 Demo board supporting the development of MCP16301 high input voltage, 600 mA, buck converter. 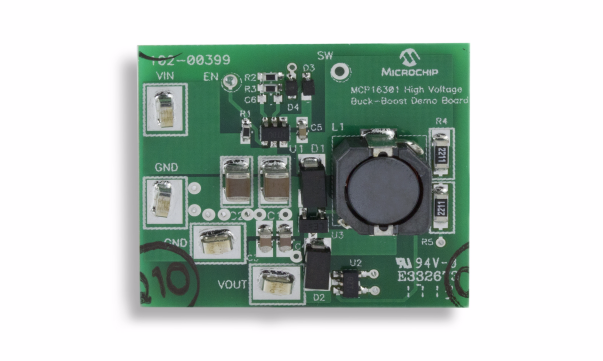 The MCP16301 High Voltage Buck-Boost Demo Board is designed to operate from a 5V to 30V input and regulate the output to 12V. Test points for input power and load are provided to demonstrate the capability of the demo board over the entire range. 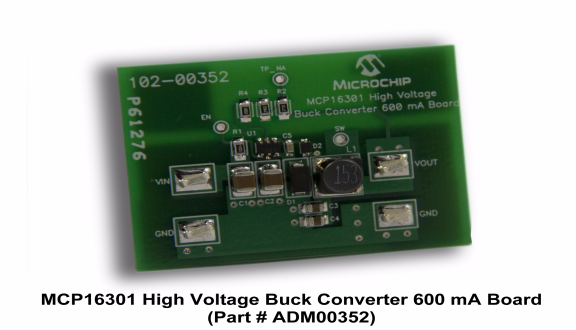 The MCP16301 High Voltage Buck-Boost Demo Board was designed using small surface-mount components to show application size for a high voltage buck-boost design. 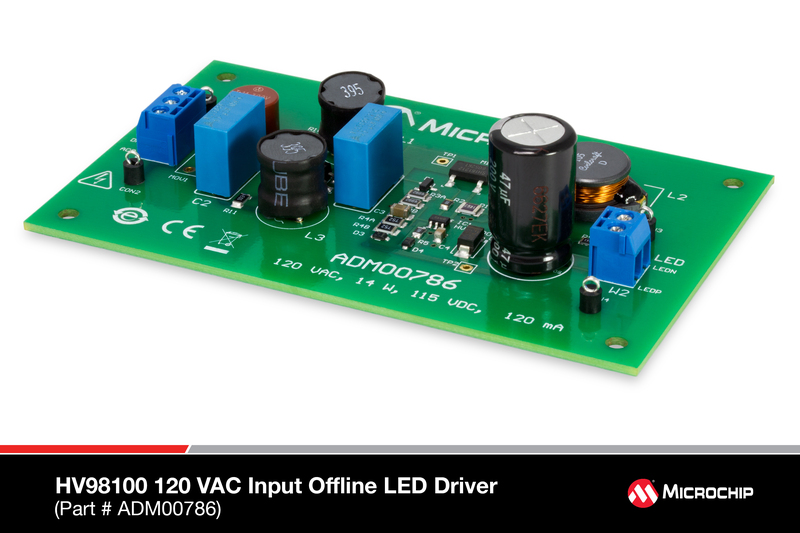 The MCP16301 High-Voltage Single-Inductor Cuk LED Driver Demo Board is designed to operate from a 6V to 18V input and regulate the output current to 300 mA. 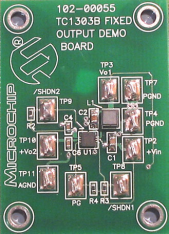 Test points for input power are provided to demonstrate the capability of the demo board over the entire range. 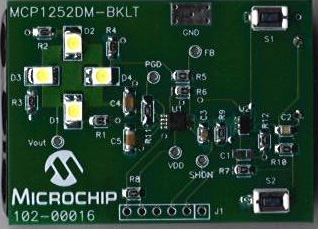 The demo board was designed using small surface-mount components to show application size for a high-voltage single-inductor Cuk LED driver design. Compared with the traditional asynchronous buck converter, the MCP16301 High-Voltage Single-Inductor Cuk LED Driver Demo Board has an additional resistor and capacitor for compensation. The MCP1631HV Digitally Controlled Programmable Current Source Reference Design is used to drive and dim one or more power LEDs in a series or parallel topology (depending on the LED’s capability). The reference design may also be used to charge one to four cell NiMH/NiCd or one to two cell Li-Ion battery packs. 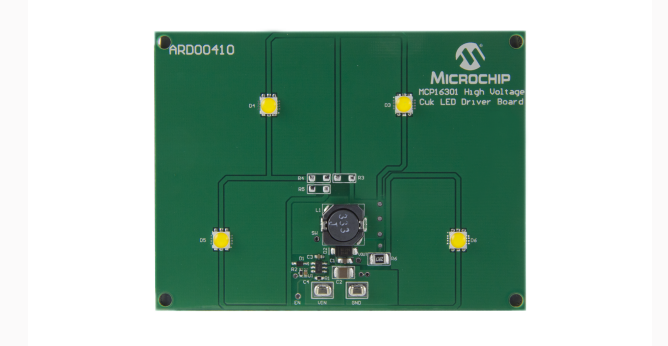 The board uses the MCP1631HV high-speed analog PWM controller and PIC16F616 microcontroller to generate the proper dimming ratio for LEDs or charge algorithm for NiMH, NiCd and Li-Ion batteries. 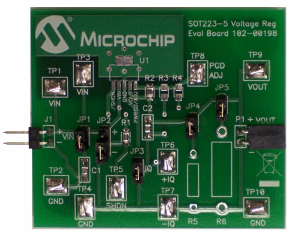 The boards is used to evaluate Microchip’s MCP1631HV in a SEPIC power converter application. 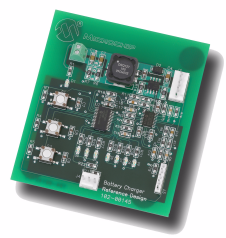 The MCP1631 Multi-Chemistry Battery Charger Reference Design is a complete stand-alone constant current battery charger for NiMH, NiCd or constant current / constant voltage for Li-Ion battery packs. When charging NiMH or NiCd batteries, the reference design is capable of charging one, two, three or four batteries connected in series. If Li-Ion chemistry is selected, the board is capable of charging one or two series batteries. 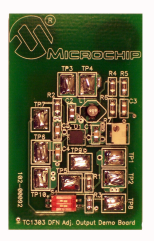 This board utilizes Microchip’s MCP1631HV (high-speed PIC® MCU PWM TSSOP-20) and PIC16F883 (28 pin SSOP). The input voltage range for the demo board is 5.5V to 16V. The MCP1640 12V/50 mA Two Cells Input Boost Converter Reference Design is designed to demonstrate the MCP1640 device’s high-voltage boost capability above its typical output range of 5.5V. 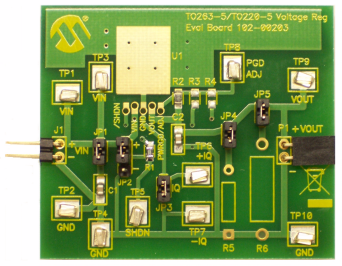 This board boosts the low-voltage input to 12V and up to 70 mA load. By changing specific resistors, a lower/higher output than 12V can be obtained. 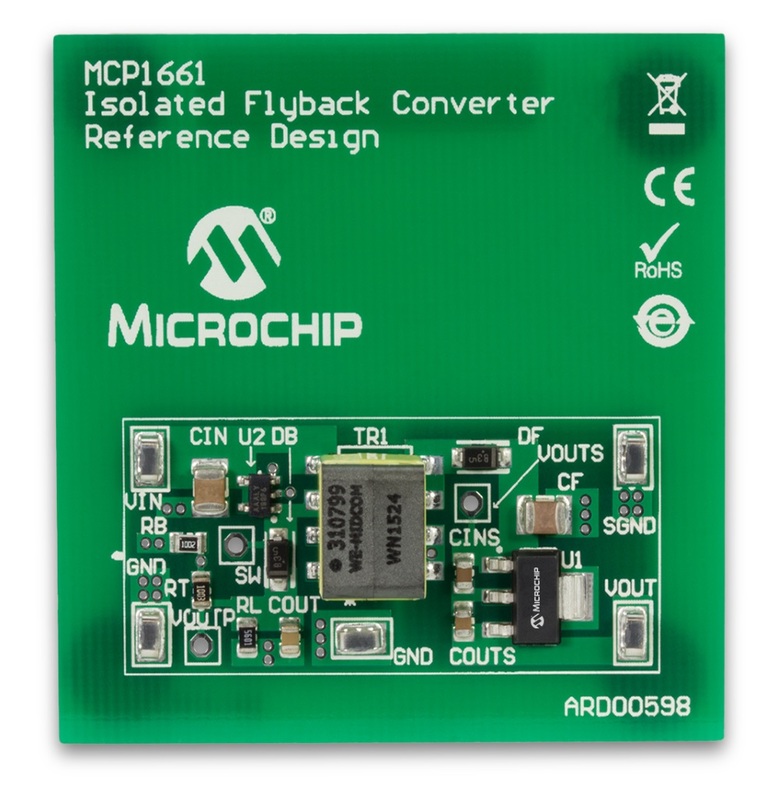 The MCP1640 Input Boost Converter was developed to help engineers reduce product design cycle time. At 2.0V input and 12V output, the board is capable of a maximum of 50 mA load current. 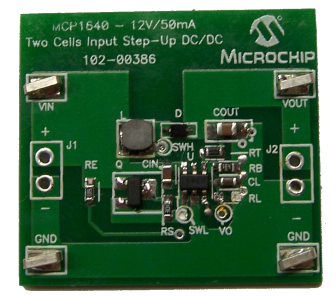 The MCP1642B Two-Cells to USB Power Evaluation Board is used to evaluate and demonstrate Microchip Technology’s MCP1642B Switching Boost Regulator. 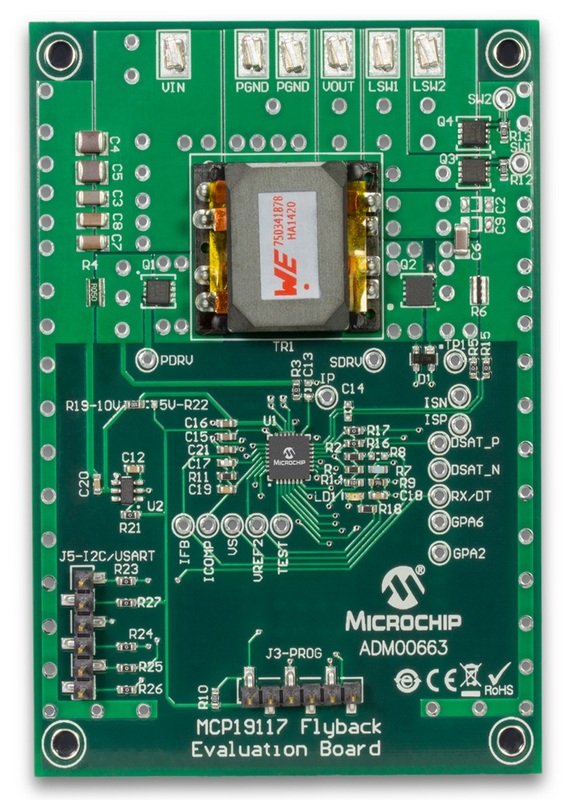 This board demonstrates the MCP1642B capabilities in a boost-converter application supplied from two AA batteries or from an external voltage source. A USB cable can be connected to the output of MCP1642B Two-Cells to USB Power Evaluation Board and used to provide power to portable electronic devices when necessary. It can be used to evaluate the MSOP-8 package. 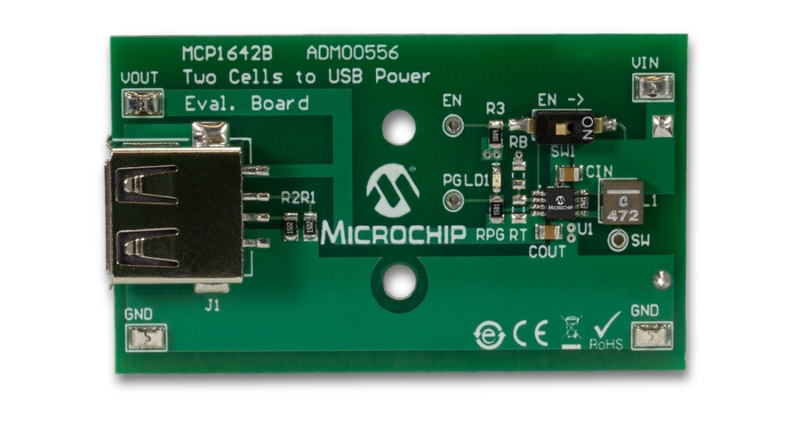 The MCP1642B Two-Cells to USB Power Evaluation Board was developed to help engineers reduce the product design cycle time. On the MCP1642B Two-Cells to USB Power Evaluation Board, the output voltage has the value of 5.0V (the fixed value MCP1642B-50 device is used), resulting in a simple and compact application. The footprints for RT and RB (resistor divider connected to the FB pin) are not populated and will only be used if MCP1642B-ADJ, the adjustable option, will be tested. An enable (EN Switch selection) is used to enable and disable the converter. When enabled, the MCP1642B will regulate the output voltage; when disabled, the MCP1642B will disconnect the path from input to output for “true-disconnect”. 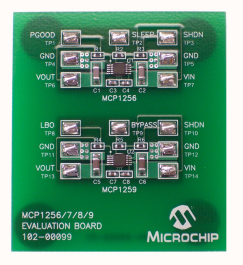 The MCP1643 Synchronous Boost LED Constant Current Regulator Evaluation Board is used to evaluate and demonstrate Microchip Technology’s MCP1643 device. 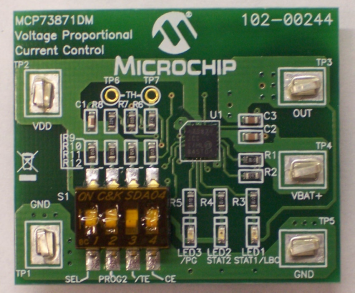 This board demonstrates the MCP1643 in a boost converter application supplied by one AA battery, or from an external voltage source, which drives an LED with three selectable currents. 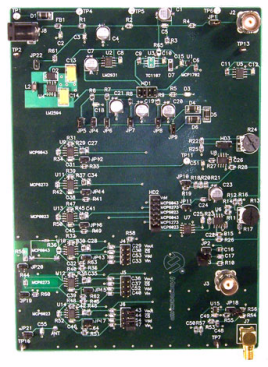 This evaluation board was developed to help engineers reduce the product design cycle time. Four output currents can be selected: 25, 50, 75 and 100mA. The output current can be changed with a dual switch that changes the external LED current sense equivalent resistance. An enable switch is used to enable and disable the converter. When enabled, the MCP1643 will regulate the output current; when disabled, the MCP1643 disconnects the path from input to output for “true-disconnect”. In this state, the current consumed from the battery is 1 µA, typically. 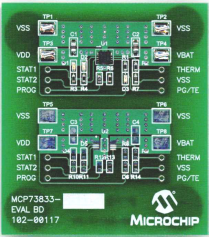 The MCP1665 12V output boost regulator evaluation board is intended to provide a platform allowing customers to easily evaluate the features of the MCP1665 device in a typical boost toplogy while also providing a reference for proper choice and layout of components that are critical to switching regulator implementations. The MCP19035 600 kHz Synchronous Buck Converter Controller is a compact, highly efficient, step-down voltage converter that will convert the input voltage rail (typically 24V) to 5V regulated output voltage. The maximum output current for this step-down converter is 5A. The board demonstrates the capabilities of the MCP19035 600 kHz Synchronous Buck Converter Controller in a typical high-voltage input step-down application. Test points for various signals are provided for measuring different parameters of the converter. The reference design can be modified to support output voltages from 3.3V to 5V by changing a single resistor. The MCP19111 is a digitally-enhanced PWM controller. It combines a pure-analog PWM controller with a supervisory microcontroller making it a fast, cost-effective, and configurable power conversion solution. The MCP19111 is ideal for standard DC-DC conversion, LED drivers, and battery charging applications. The ARD00609 Demo Board demonstrates how the MCP19111 device operates as a PMBus-enabled POL converter over a wide input voltage and load range. The firmware is preloaded in the MCP19111, no software development is needed. An USB to PMBus bridge is included on board allowing direct communication with a PC. Nearly all operational and control system parameters are programmable and readable via the PMBus. A full featured and easy to use GUI may be downloaded from the Microchip site. Alternatively, the user can program the MCP19111 using their own firmware, tailoring it to their application. The evaluation board contains headers for ICSP™ (In-Circuit Serial Programming™) I2C / PMBus communication and mini USB connector. PLEASE NOTE: This kit does NOT contain the hardware programming tool. Please use Microchip’s PICKIT3 (PG164130). The MCP3903 ADC Evaluation Board for 16-bit MCU system provides the ability to evaluate the performance of the MCP3903 six channel sigma-delta ADC. It also provides a development platform for 16-bit PIC-based applications, using existing 100-pin PIM systems. 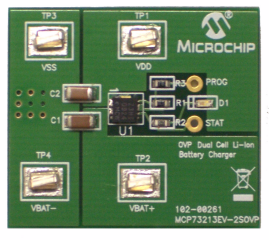 The MCP73213 OVP Dual-Cell Li-Ion Battery Charger Evaluation Board demonstrates the features of Microchip’s MCP73213 Dual-Cell Li-Ion / Li-Polymer Battery Charge Management Controller with Input Overvoltage Protection. 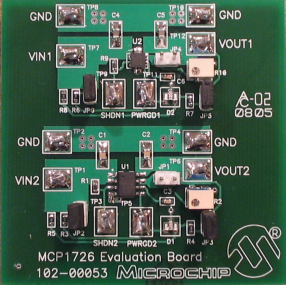 Two evaluation boards are provided in the MCP73831 Evaluation Kit. The boards are set up to evaluate simple, stand-alone, linear charging of single cell Li-Ion / Li-Polymer battery packs (the battery packs are not included). Each board design provides constant current charging followed by constant voltage charging with automatic charge termination. In addition, the MCP73831-2AC board provides preconditioning of deeply depleted cells. Each board design provides evaluation of the MCP73831 in two package options: a SOT23-5 and a 2 mm x 3 mm, 8-Lead DFN for higher power handling capability. 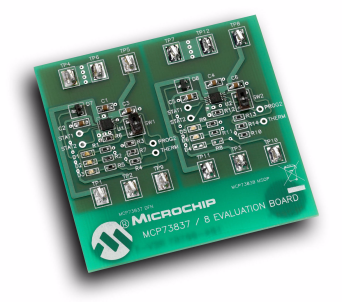 The MCP73833 Evaluation Board is an evaluation and demonstration tool for Microchip’s MCP73833/4 Stand-Alone Linear Li-Ion/Li-Polymer Charge Management Controllers. Two independent circuits are provided (only one is populated) for charging single cell Li-Ion / Li-Polymer battery packs (the battery packs are not included). Each circuit design provides constant current charging followed by constant voltage charging algorithm with automatic charge termination and battery temperature monitoring. In addition, the installed MCP73833-FCI/MF provides preconditioning of deeply depleted cells and a safety timer. The MCP73833 Evaluation Board provides for evaluation of the MCP73833/4 in two package options: a MSOP-10 (not populated) and a 3mm x 3mm, 10-Lead DFN for higher power handling capability (MCP73833-FCI/MF installed). 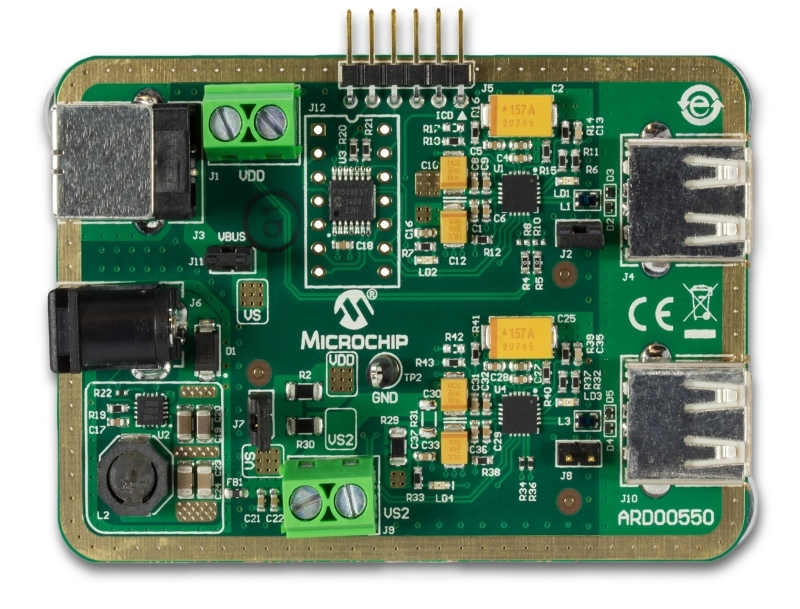 The MCP73837/8 AC/USB Dual Input Battery Charger Evaluation Board demonstrates Microchip's stand-alone Linear Li-Ion Battery Chargers - MCP73837 and MCP73838. The MCP73837/8 require only minimum components to implement a complete battery charge management circuit. The MCP73837/8 are designed to select AC-Adapter or USB-Port Power Source automatically where AC-Adapter provides the charge current when both sources are present. The MCP73837/8 AC/USB Dual Input Battery Charger Evaluation Board comes with a 10-pin DFN MCP73837 and a 10-pin MSOP MCP73838 pre-installed. 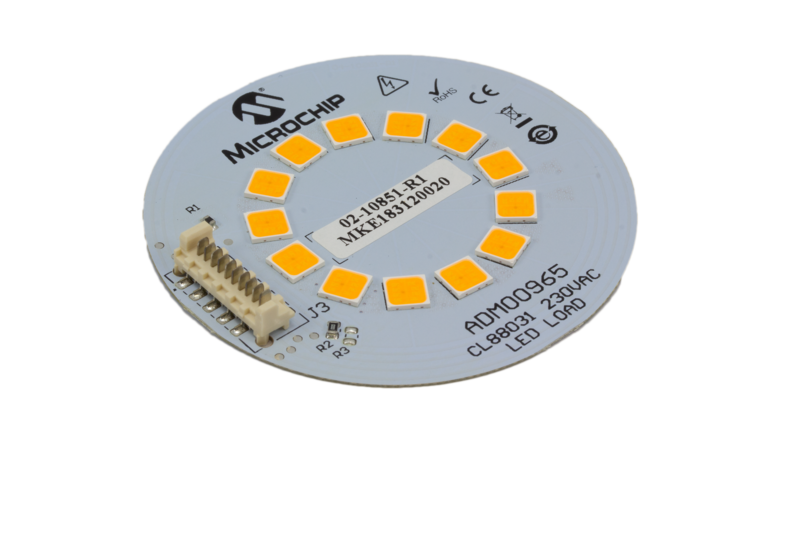 The different packages can be easily evaluated by replacing the device, a resistor and a LED where the patterns have been pre-designed on the board layout. 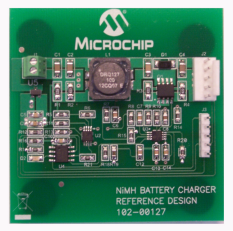 This reference design is developed to assist product designers in reducing product design cycle and time by utilizing Microchip’s favorite stand-alone Li-Ion battery charge management controllers with system power path management. The MCP73855 Battery Charger Evaluation Board is set up to evaluate simple, stand-alone, linear charging of single cell Li-Ion/Li-Polymer battery packs (the battery packs are not included). The board design provides constant current charging followed by constant voltage charging with automatic charge termination. 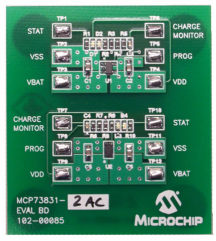 As provided, the MCP73855 Battery Charger Evaluation Board is set for a fast charge current level of 85 mA. The MCP73855 is equipped with shutdown control, status indicator, and safety timers. Refer to the data sheet for details on the device features. 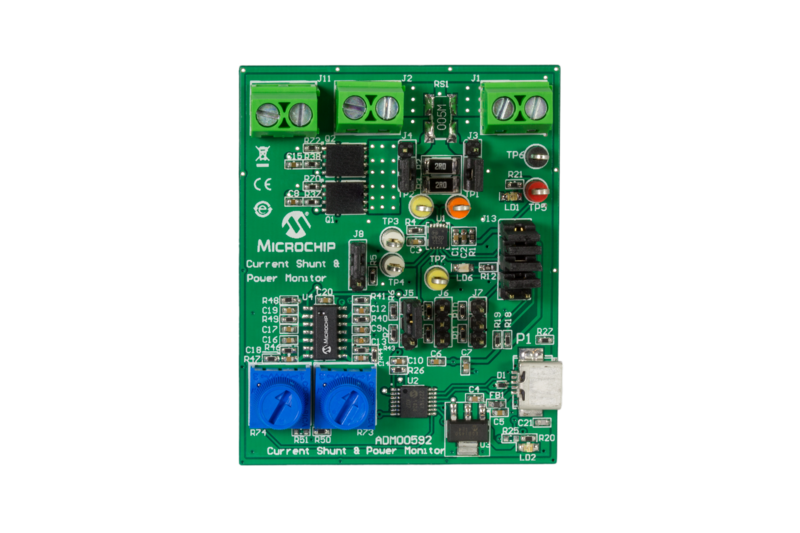 The MCP73871 Demo Board with Voltage Proportional Current Control is designed to demonstrate Microchip's stand-alone linear Li-Ion battery charger with system power path and load sharing management control solution. The MCP73871 integrates the required elements to meet design challenges when developing new Li-Ion / Li-Polymer batteries powered products. 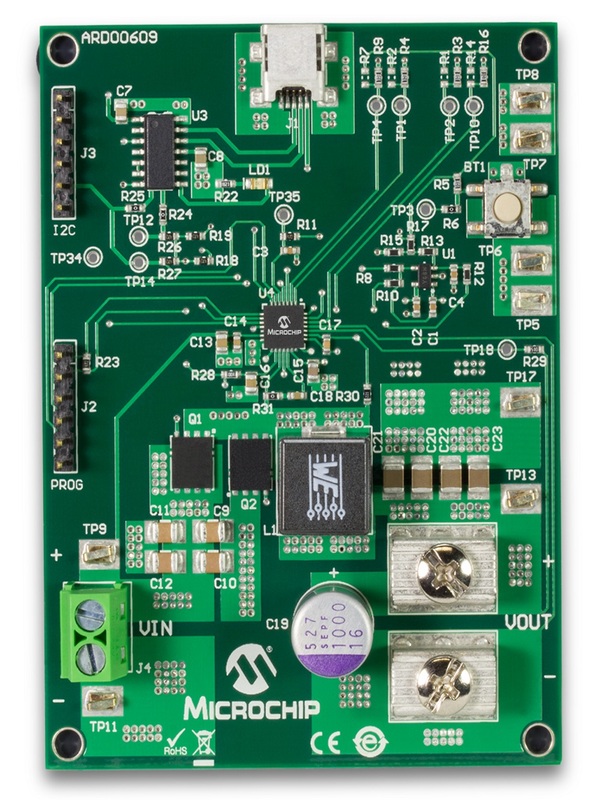 The MCP73871 Demo Board with Voltage Proportional Current Control is designed to deliver minimum 1.5A total current to system load and to a single cell Li-Ion battery at 4.2V preset voltage regulation (4.1V, 4.35V and 4.4V options are also available for MCP73871). The board has a dip switch helping to decides the input power source between AC-DC wall adapter and USB port (AC/USB) and control input current limits, enable charge timer and enable charging. 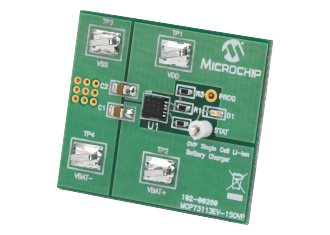 The MCP73871 Demo Board with Voltage Proportional Current Control comes with a factory preset low-battery indicator (LBO) when input is absent. The preset value is 3.2V and STAT1 LED (green) with turn ON if the battery voltage is below the threshold voltage. 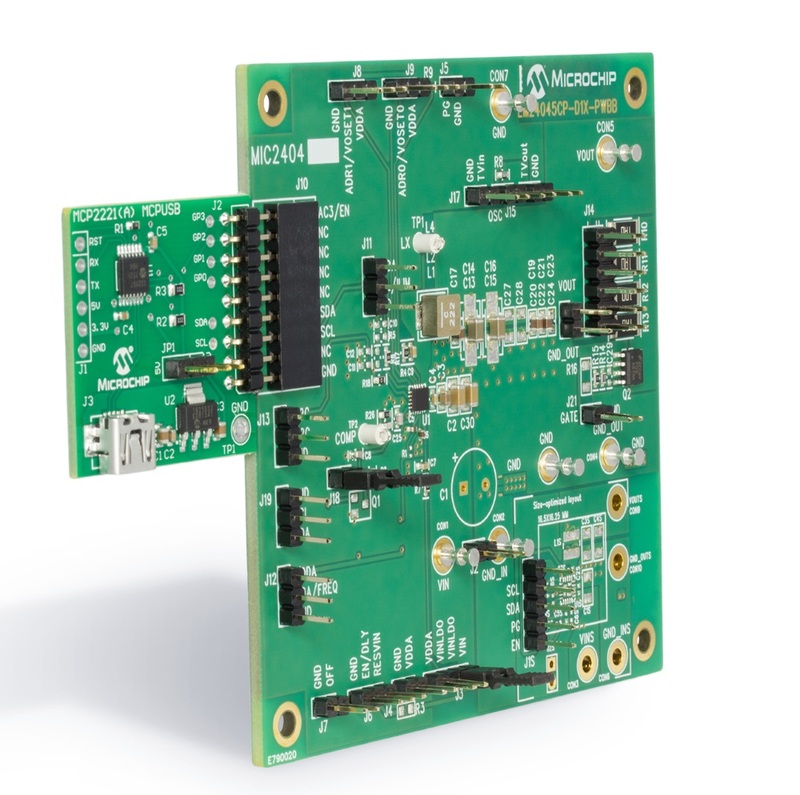 The MCP73871 Evaluation Board is designed to demonstrate Microchip's stand-alone linear Li-Ion battery charger with system power path and load sharing management control solution. The system load is also supported by the Li-Ion battery when input power is disconnected. A number of device options allow the MCP73871 device to be utilized in a variety of applications. Refer to the MCP73871 data sheet (DS22090). Typical applications for the reference design are: Smart Phones, PDA, Portable Media Players, MP3 Players, Digital Cameras, Handheld Medical devices, Bluetooth headsets, Ultra-Mobile PC and Portable Communicators. 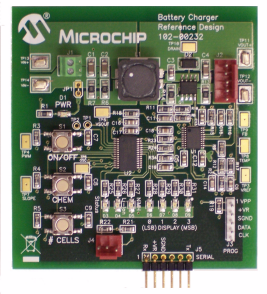 The MCP73X23 Lithium Iron Phosphate Battery Charger Evaluation Board demonstrates the features of Microchip’s MCP73123 and MCP73223 Lithium Iron Phosphate (LiFePO4) Battery Charge Management Controller with Input Overvoltage Protection. 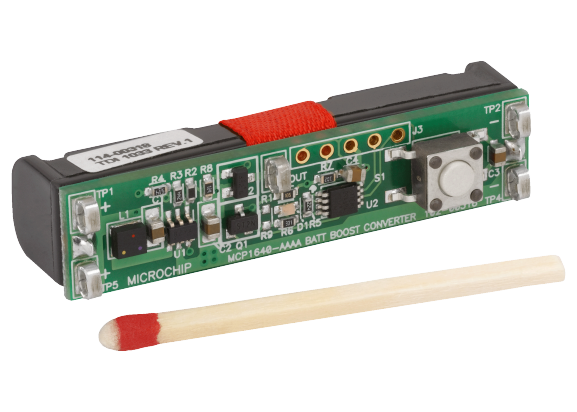 The MIC23158/9 Evaluation Board features independent Enable connectors with individual pull-up resistors. To check the status of each regulator, power-good connectors are available for each regulator. The board can be powered from two independent voltage sources or a 0Ω resistor can be placed on R3 so that both converters be powered form the same voltage source. 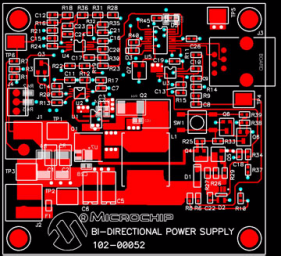 The MIC24045 Evaluation Board is designed to serve all of the devices that make up Microchip’s MIC2404x family of parts. As a result, only a subset of its features is needed for the MIC24045 evaluation. Specific for the evaluation of the MIC24045 device, the VIN supply ranges from 4.5V to 19V and output voltage from 0.64V to 5.25V in 5 mV, 10 mV, 30 mV and 50 mV steps at 5A. Additionally, an on-board load transient generator circuit and connections for loop gain measurements are provided. A connector (J10) matching the MCP2221 Breakout Module I2C interface is provided for board compatibility with I2C. 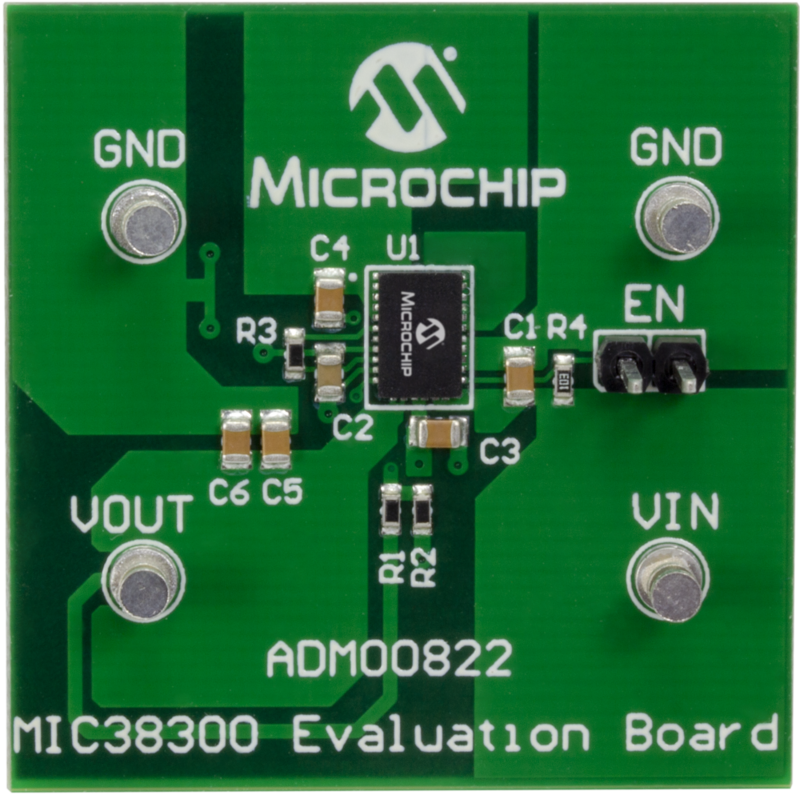 The MIC2810 Evaluation Board is used to demonstrate the capabilities of MIC2810 PMIC which can deliver 600mA from a DC/DC buck converter and 300mA from each of the two stand-alone LDOs. The board accepts an input voltage from 3.6V to 5.5V and will deliver an output voltage of 1.8V for the DC/DC converter, 1.25V and 3.3V from the LDOs. 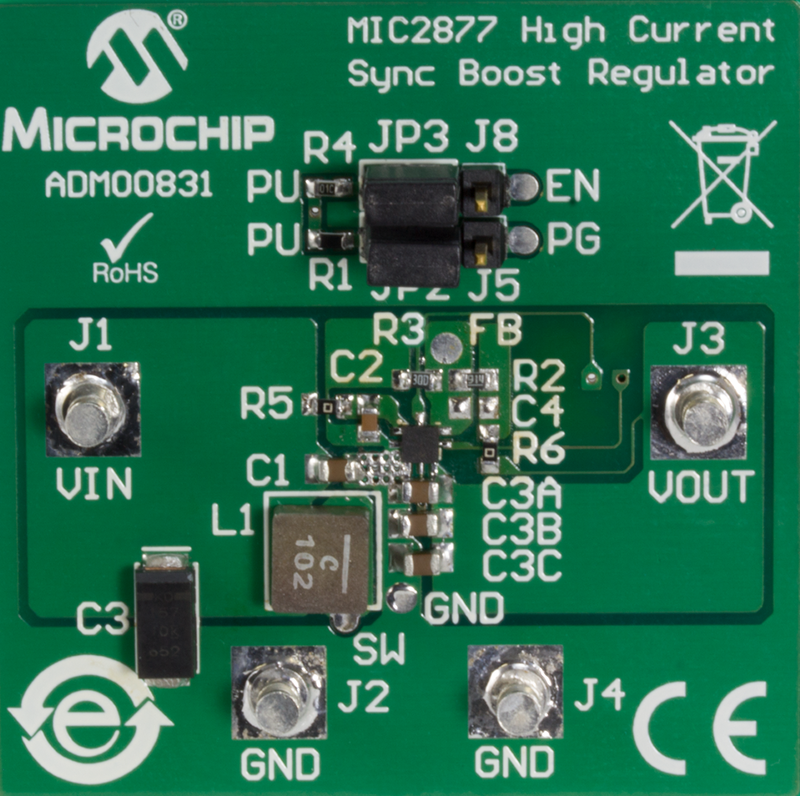 The MIC3223 is a constant-current boost switching controller specifically designed to power a string of high-power LEDs. The MIC3223 has an input voltage range from 4.5V to 20V and is ideal for a variety of applications. 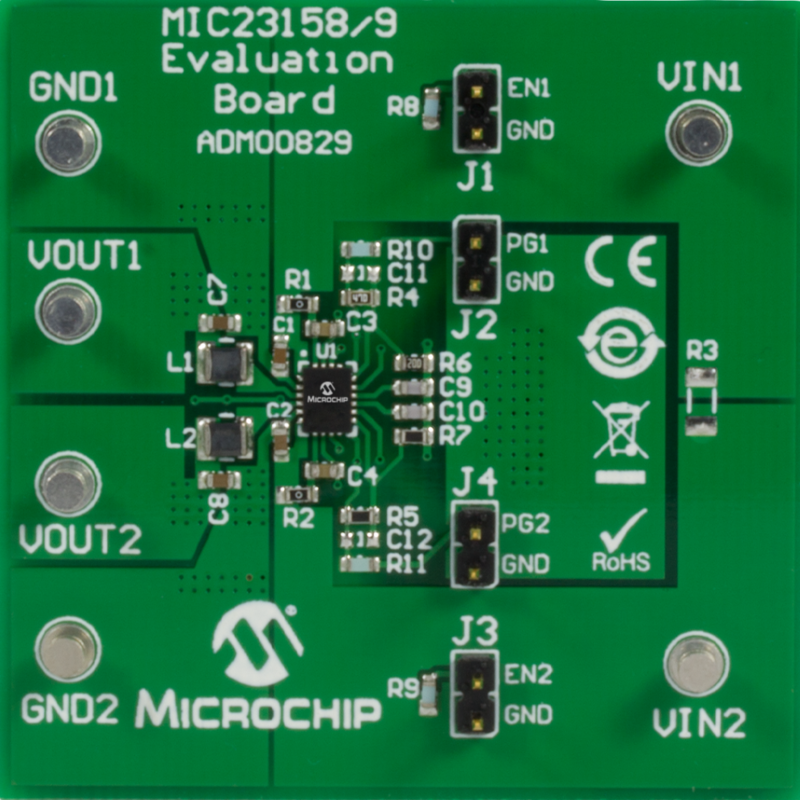 The MIC3223 evaluation board is designed to accommodate for a VIN of 6V to 20V. 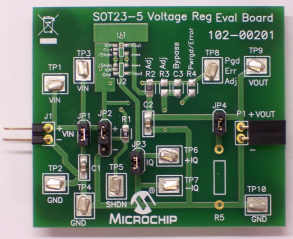 The SOT23-3 Voltage Regulator Evaluation Board does not come with a voltage regulator soldered onto the board. This allows the user to attach the voltage regulator of their choosing to the board and perform quiescent current, ground current, Power Supply Ripple Rejection (PSRR), and other desired tests. The SOT23-3 Voltage Regulator Evaluation Board is based upon a modular concept which will allow the user to plug in additional boards to increase the test capability of the voltage regulator. The SOT23-5 Voltage Regulator Evaluation Board is designed to provide functional evaluation of Microchip Voltage Regulators that utilize the SOT23-5 package. The SOT23-5 Voltage Regulator Evaluation Board does not come with a voltage regulator soldered onto the board. This allows the user to attach the voltage regulator of their choosing to the board and perform quiescent current, ground current, PSRR, and other desired tests. 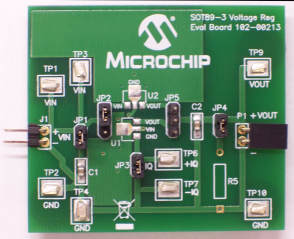 The SOT89-3 Voltage Regulator Evaluation Board is designed to provide functional evaluation of Microchip Voltage Regulators that utilize the SOT89-3 package. The SOT89-3 Voltage Regulator Evaluation Board does not come with a voltage regulator soldered onto the board. This allows the user to attach the voltage regulator of their choosing to the board and perform quiescent current, ground current, PSRR, and other desired tests. 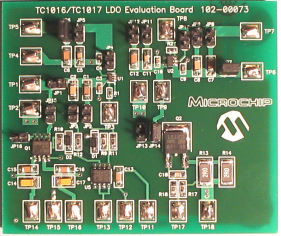 The TC1016/17 LDO Linear Regulator Evaluation Board allows the user to evaluate Microchip’s 80 mA (TC1016) and 150 mA (TC1017) Low Dropout (LDO) regulators. The evaluation board contains two independent LDO circuits that allow the user to evaluate the TC1016 and TC1017 devices in the 5-pin SC-70 and the 5-pin SOT-23 packages. The evaluation board is populated with 1.8V and 3.0V TC1017 devices. Any of the available output voltage values of the devices (1.2V to 5.0V) can be used on this board. Fixed input and output capacitor values of 1.0 µF are hard wired on the board while alternate values of 4.7 µF and 10 µF can be selected via jumpers. Line and load step circuitry is also provided. The TC110 is a step-up (Boost) switching controller that can regulate output voltage with a typical start-up voltage of 0.9V. 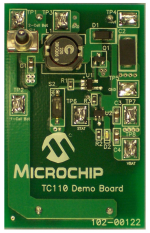 The TC110 Boost Converter Demo Board also includes a MCP73832 Miniature Single-Cell, Fully Integrated Li-Ion, Li-Polymer Charge Management Controllers. 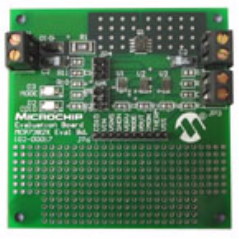 Microchip’s MCP73832 is a highly advanced linear charge management controllers for use in space-limited, cost-sensitive applications. The TC110 Boost Converter Demo Board is a ready to use solution for portable applications when no DC plug is available. The TC110 Boost Converter Demo Board can efficiently transfer energy from Alkaline batteries to Li-Ion battery pack. The TO220-5 / TO263-5 Voltage Regulator Evaluation Board is designed to provide functional evaluation of Microchip Voltage Regulators that utilize the TO220-5 and TO263-5 package. The TO220-5 / TO263-5 Voltage Regulator Evaluation Board does not come with a voltage regulator soldered onto the board. This allows the user to attach the voltage regulator of their choosing to the board and perform quiescent current, ground current, PSRR, and other desired tests. This UCS1002 and PIC16F1503 Reference Design is a fully functional universal serial bus (USB) charger compatible with a large variety of portable devices. The UCS1002 programmable port-power controller can deliver up to 2.5A charging current. 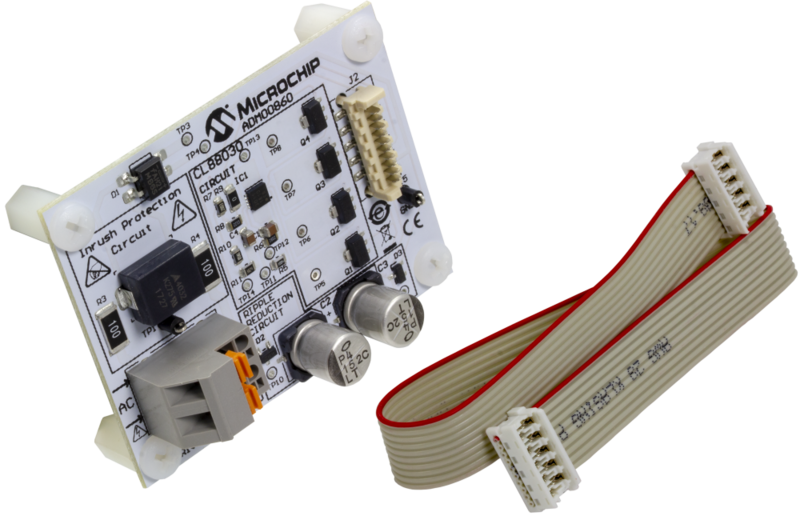 Features like current monitoring and programmable charger emulation profiles make it a good candidate to be used with a PIC® Microcontroller for intelligent USB charging solutions. The algorithm implemented in the PIC microcontroller applies multiple charger emulation profiles and selects the one that provides the highest current to the attached device. For more information regarding the code, refer to AN1827 – "UCS1002 Highest Current Algorithm Using a PIC® Microcontroller” (DS20001827A). 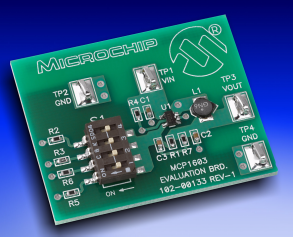 The board can be powered from 5V directly or through the MCP16323 Synchronous Buck Regulator which allows 6-18V input.